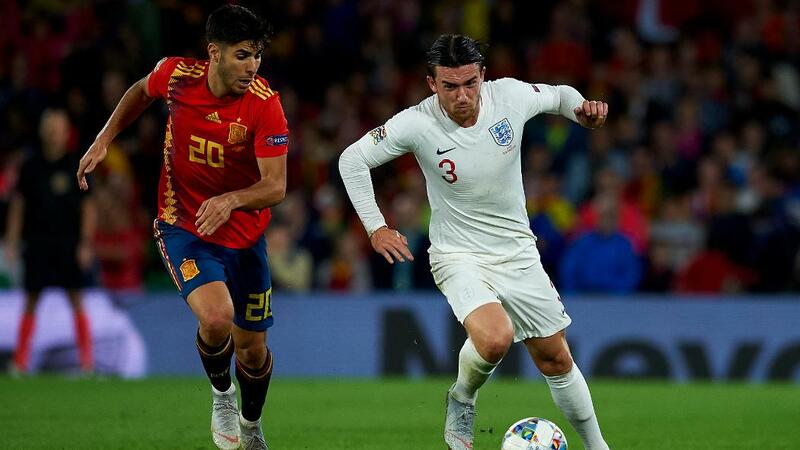 Leicester City Academy graduate Ben Chilwell and defensive colleague Harry Maguire starred as England defeated Czech Republic 5-0 in UEFA European Championship qualifying at Wembley on Friday. In their maiden Euro qualifier, ahead of next summer's cross-continent tournament, Raheem Sterling struck first, while a Harry Kane penalty doubled their lead before the interval. Sterling added another after the break and capped off a fantastic hat-trick from distance before Tomáš Kalas's own goal wrapped up a comfortable evening for England in front of a capacity crowd. As a result of Chilwell, 22, making his sixth appearance for Gareth Southgate's side, he climbs to joint-eighth in the list of LCFC players to star for the English senior team while at the Club. Wembley paid a heartfelt tribute to former Leicester City and England goalkeeper Gordon Banks OBE, who won the World Cup in 1966. The Academy graduate overtakes Horace Bailey, Len Barry, Hughie Adcock and Emile Heskey - on five - and is now level with Ernie Hine on the Club's all-time tally. The Three Lions will be in Euro qualifying action once again on Monday evening when they tackle Montenegro at Podgorica City Stadium (7:45pm GMT kick-off). Should Chilwell appear, the enterprising left-back will go level with Steve Whitworth and Gary Lineker in the appearance charts. Maguire, 26, is in fourth-place on 17 caps. Former Leicester City striker and pundit Tony Cottee catches up with LCFC TV to discuss the Club's growing count of England stars. Elsewhere, tough-tackling midfielder Wilfred Ndidi, 22, started for Nigeria as the Super Eagles defeated Seychelles 3-1 during their final Africa Cup of Nations qualifier in Asaba. Gernot Rohr's men, who have already secured their place in the finals, came out on top following goals from Odion Ighalo, Henry Onyekuru and Moses Simon. Ndidi could earn a 24th cap for his country on Tuesday evening when they host Egypt at Stephen Keshi Stadium in a friendly fixture (5pm GMT kick-off). Defender Çağlar Söyüncü, 22, on the other hand, was an unused substitute for Turkey as they defeated Albania 2-0 in Shkoder, courtesy of efforts from Burak Yılmaz and Hakan Çalhanoğlu. England's Under-18s, with Luke Thomas among the squad, were beaten 1-0 by Czech Republic in the UAE Sports Chain Cup, while Viktor Johansson's Sweden Under-21s lost 2-0 to Russia. For more on City's international contingent, stay tuned to LCFC.com this week before attention returns to the Club's Premier League campaign.